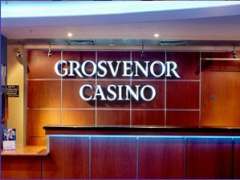 The Grosvenor Casino on George Street is one of the two Grosvenor casinos in Manchester and like all casinos belonging to the prestigious brand, offers you the perfect night out. You can choose to play from a variety of games including Roulette, Blackjack or Stud Poker, if card games are your game of choice. There are a total of 46 gaming machines including 20 slot machines and 26 virtual Roulette stations. The staff at the casino are friendly and if you need information on how a game is played, simply ask for a free manual. Grosvenor are specialists in organising parties and events - it could be a birthday, a celebration, an office party, or a stag night. Whatever your need, the casino can make it happen for you. No membership is required to play or dine at Grosvenor. All patrons over the age of 18 are invited to come along and have a good time at the casino. The Grosvenor is now open 24 hours a day, 7 days a week. The restaurant opens at 7pm and closes at 1am, 7 days a week. The restaurant at Grosvenor Casino is perfect for a night out with great offers and delicious food. The Grilled Halibut Steak and Braised Lamb Shank are very popular with the clientele and for those who just fancy a nibble, take a look at the extensive list of starters. The restaurant naturally has a great selection of wines, spirits and beers. The restaurant has special offers on set menus including a Starter and Main Course for only £9.95 and special £5 Meals. Tea and coffee are served complimentary with all meals. The bar is just the right place to relax after a round of gaming or to meet up with friends. Sit back and enjoy a drink or a bite to eat. Grosvenor has special packages for every kind of occasion and one that suits every budget. The Straight Flush experience is a great way to try out everything the casino has to offer at a reasonable price of £20 per person. The package includes, a drink at the bar, bar snacks up to the value of £10, £5 slots voucher, £5 gaming chips and a £75 online casino bonus and VIP weekend prize draw. The Full House Experience is perfect for a group of people looking to have an entertaining night out. Whatever the occasion, be it a stag night, a hen party or any other celebration, try this package out which is a steal at £30 per person for a minimum group of 4. The package includes drinks at the bar, a three-course meal, £5 slots vouchers, £5 gaming chips, gaming tuition and a £75 online casino bonus and VIP weekend prize draw. The third special experience package is the Royal Flush at £20 per person for a minimum group of 10 people. This super package includes drinks at the bar, buffet for the group, £5 slots voucher, £5 gaming chip, Gaming tuition and a £75 online casino bonus and VIP weekend prize draw. The casino hosts events including special packages for poker players. To know more, visit the casino or their website.